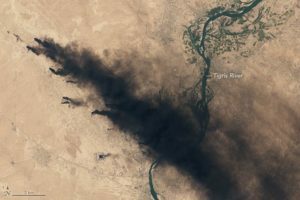 Islamic State of Iraq and Levant (ISIL) is destroying the environment and endangering the health of thousands of people as it retreats from its areas of control in Iraq. Smoke from a fire set by ISIL terrorists at a large sulfur plant near Mosul can be seen from space. Sulfur-dioxide pollution from the fire, which can cause severe respiratory problems and irritate the eyes and throat, has killed two people and sent at least 1,000 others to hospitals. U.S. forces in the region are wearing gas masks and other protective gear in response. In June, ISIL set fire to at least 19 oil wells near Qayyarah, a small town south of Mosul near the Tigris River. As Iraqi troops advanced, the fire filled the air with black carbon and thick toxic fumes. On Aug. 28, as Iraqi forces entered Qayyarah, ISIL reportedly opened up oil pipes in the town and flooded the streets with crude. UNICEF arrived the next day and found oil spilling into the Tigris River — the town’s main source of drinking water. In October, as Iraqi forces pushed toward Mosul, ISIL reportedly began filling trenches with crude oil and set them on fire to make it harder for American and Iraqi warplanes, drones, and attack helicopters to find and hit targets inside the city. Wim Zwijnenburg, a Humanitarian Disarmament Project Leader for the Dutch group PAX, said there are a number of other industrial sites in Mosul that could be damaged in battle or deliberately sabotaged by ISIL. An attack on sewage sites, for instance, could lead to an outbreak of communicable diseases, he said.